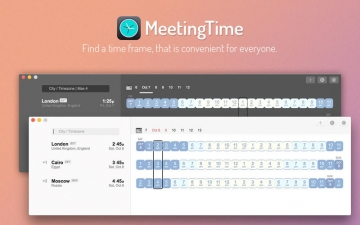 MeetingTime - Across Different TimeZones | Mac App Storeのアプリ検索・ランキング BuzzMac! 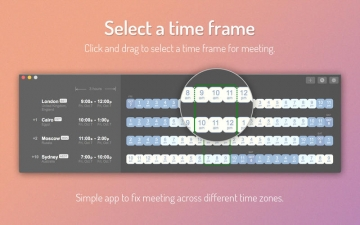 MeetingTime is a simple Application for Mac that helps you in arranging meetings across different time zones. 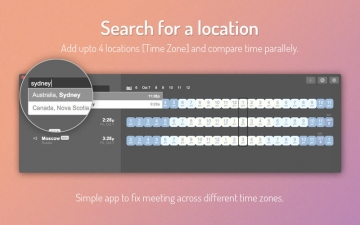 It lets you add up to four different locations and place them parallely to see at what time the meeting is going to take place in other regions. This app is fairly simple and easy to use. 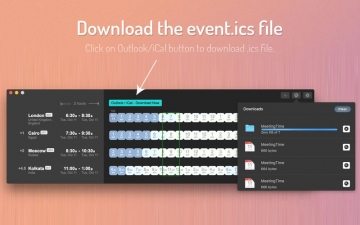 After selecting a time window; meeting time and date, users can download the .ics file and double click on it to add the event in iCal. -Add up to 4 location (Time Zones). -See local time of each time zone. -Click and drag to select a time frame. -Download .ics file to add event in iCal easily. -Open multiple windows and add more time zones. MeetingTime is going to be your go to app whenever you need to fix an appointment or schedule a call to someone from a different time zone. 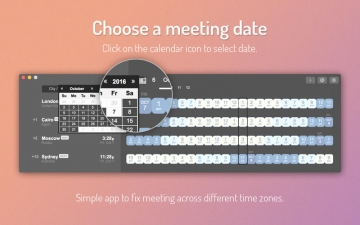 So, download MeetingTime today and book appointments in minutes.